Our newly-3-year-old, Keadryn, has a passion for pizza. And my husband, Drew, has a passion for food in general. 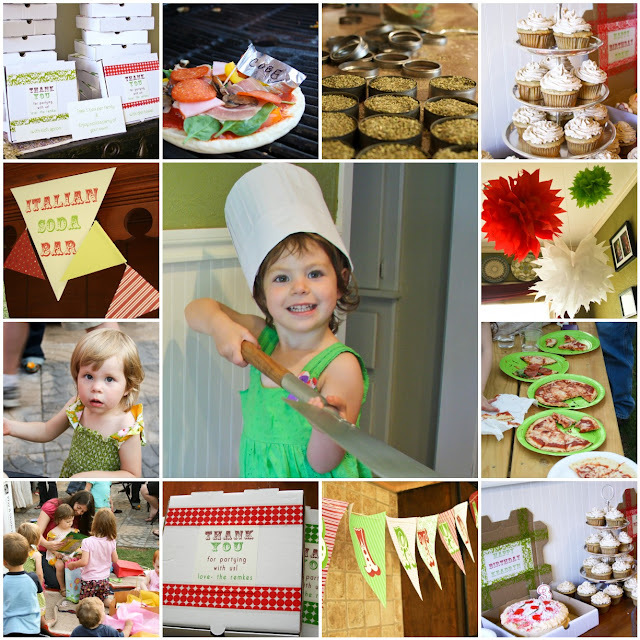 So naturally, their combined 3rd+30th birthday party theme was PIZZA! The Italian Soda Bar- This was a hit beyond what I could’ve imagined. 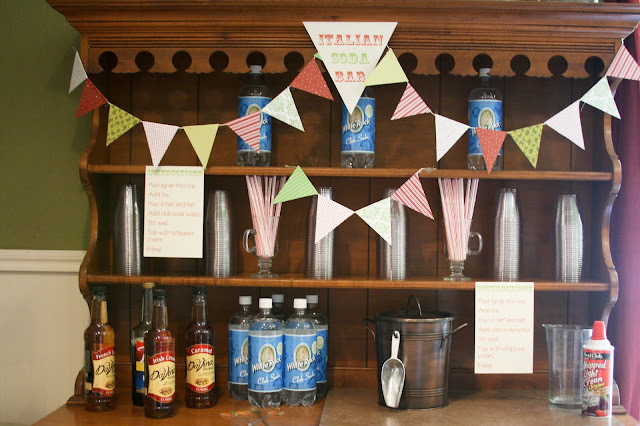 Give people club soda, half & half, flavored syrups and Italian Soda making directions and the result is a happy crowd sipping on self-customized refreshments! 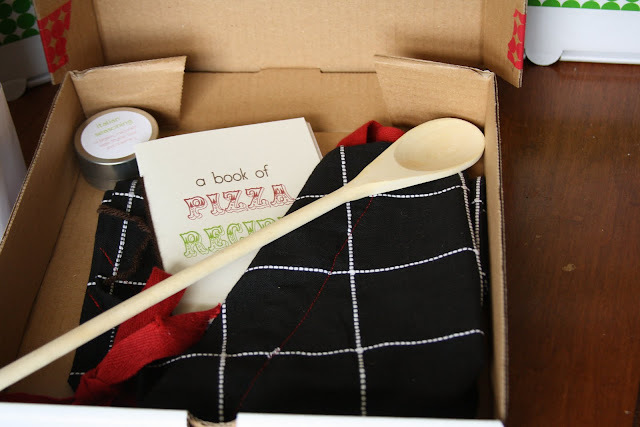 Make Your Own Gourmet Pizza– I mentioned on Sunday that we went through sixty (yep, 60!) flatbreads. 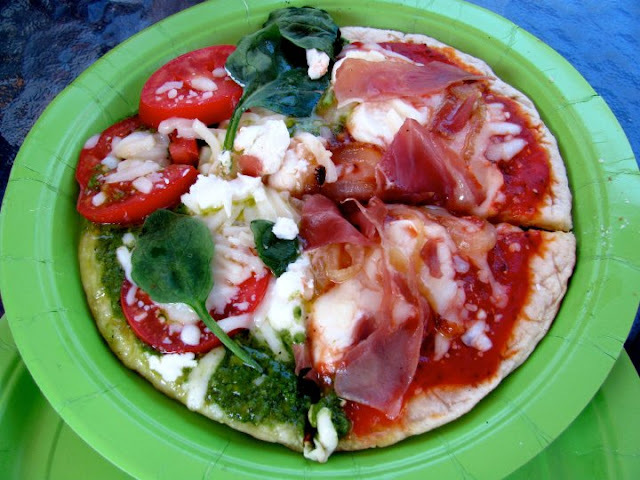 We used the flatbreads as a pizza base, offered an assortment of pizza toppings ranging from basic (think pepperoni and shredded mozzarella) to gourmet (all sorts of specialty cheeses, prosciutto, veggies, etc.) and let our guests go to town. Yummy! And easy! Decor- Banners and bunting and pom poms, oh my! Favor Boxes Extraordinaire- Our guests took home pizza boxes filled with pizza recipes, tins of italian seasonings, little aprons and wooden spoons. Perhaps my favorite part of these were how much fun Keadryn and I had putting them together beforehand! Wow. F.A.B.U.L.O.U.S. Really. that was one great party. Love the idea. Love the decorations. Love the gift at the end. Love it all. Love it. I want to remember this one. Oh I am so in love with this party! What a great idea. This would make a great theme party to host this summer. Love it all but especially those favor boxes! I hate the goddie bags kids get at parties full of choking hazards and sugar… love when the favors are useful! Absolutely adorable! I was planning a girl's get together with pizza sometime this summer, and this has totally inspired me!!! Everything from the soda bar to the favors are absolutely precious! HOW FUN!!!! I love this idea! One of the most creative ones I've seen in a while! Now, when can I do this real soon?!?!? soooo cute!! i am so sad we missed it!! it was adorable! LOVE THIS SO MUCH! Stop over and link it up in my Pizza Link up. I would LOVE to have you and any of your other post involving pizza. I’m following you on Pinterest and will pin this if you link up! Thanks and you rock! I love your pizza party…great ideas! I’m having my son one for his 5th birthday in July, where should I look for the pizza boxes? 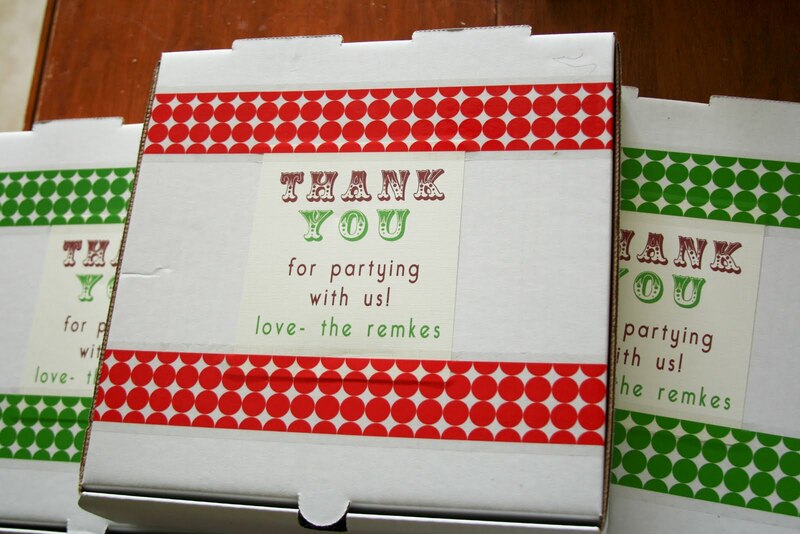 I would love to give them for favors. Hey Kristen- so fun that you’re doing this theme (isn’t it fun)?